The «module 5 – Project implementation and valorisation of results; finance and budgeting; and monitoring and evaluation» is available in free download. The Module 5 considers the diverse issues regarding the implementation of the partnership when an application is accepted. Three areas will be considered: first, implementing the project and valorizing (that is, disseminating and exploiting) the results and outputs; second, finance and budgetary control; third, monitoring and evaluation of the project progress and outputs. 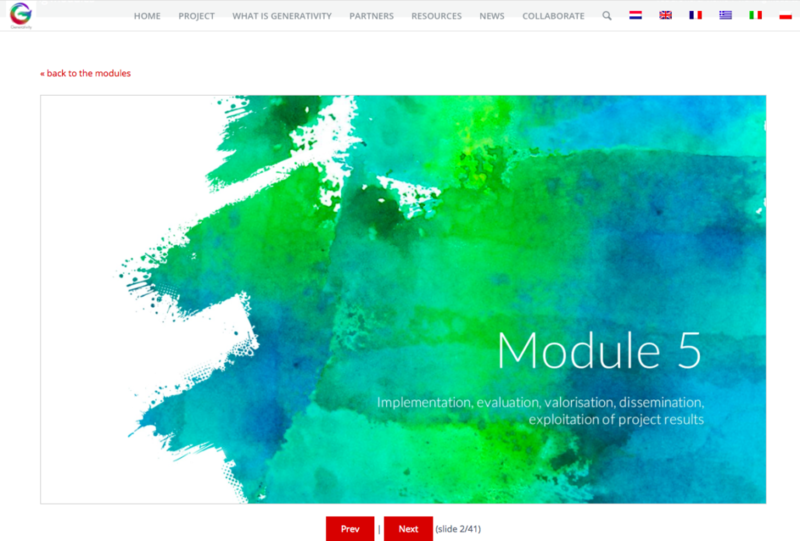 The «module 5 – Project implementation and valorisation of results; finance and budgeting; and monitoring and evaluation» is available in English, French, Italian, Polish, Greek and Dutch. The module in download is accessible here. http://generativity.eu/wp-content/uploads/2018/03/module-5-screenshot306.png 793 1173 teamGenerativity http://generativity.eu/wp-content/uploads/2016/12/small_logo-180x180.jpg teamGenerativity2018-03-15 19:23:442018-03-15 19:31:25The "module 5 - Project implementation and valorisation of results; finance and budgeting; and monitoring and evaluation" is available in free download. The «module 4 -Submission procedures according to the guidelines of the EU Commission» is available in free download.